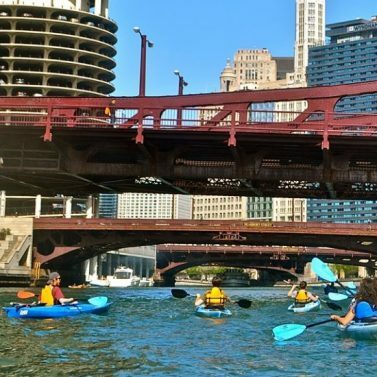 Chicago Kayak Tours and Rentals | Wateriders – Experience the best Kayak Tours and Rentals on the Chicago River! Begin your journey at the river’s hub. Our launch at the East Bank Club starts you minutes from downtown via scenic Wolf Point, where the three branches of the river meet and the city’s magnificent views blossom. Just a minute's walk from the river, our validated parking garage is conveniently located and offers the best deal in the area: $4 + 50 cents per hour! 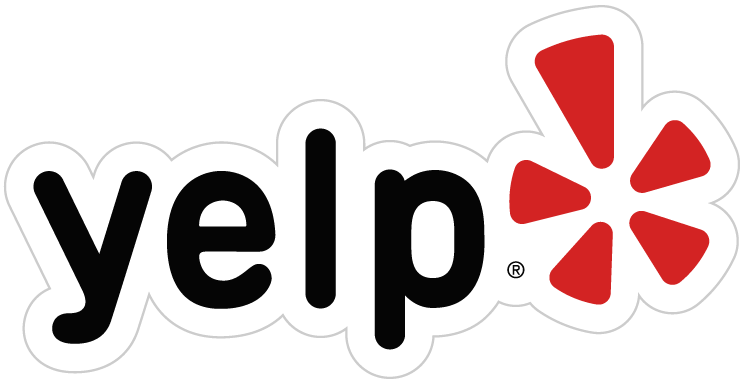 We are also very easy to reach by bike, train (Metra or L), bus, rideshare, or foot. With our central location near the Loop, River North, West Loop, and River West, you will not get a better value anywhere on the river. 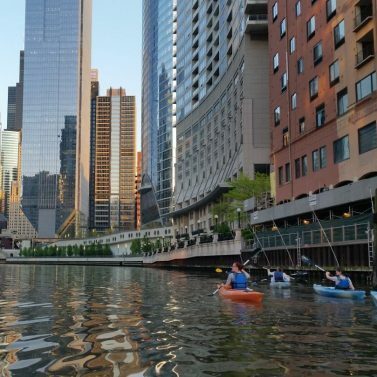 Maximize your time by paddling in the downtown area! Do you feel like you may need some coaching? We'll jump on the water with you if you are feeling nervous, or if you look like you need some assistance. While everyone receives an on-land lesson, we'll give additional on-water training to those who may struggle at first. 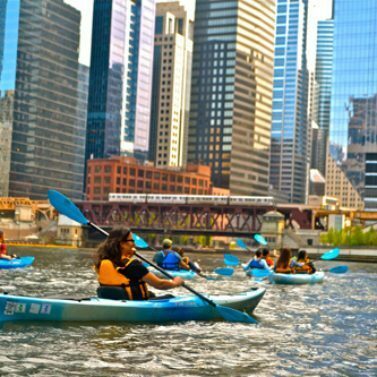 Locally owned and operated, we were the first company to host kayak tours on the Chicago River in the downtown area. 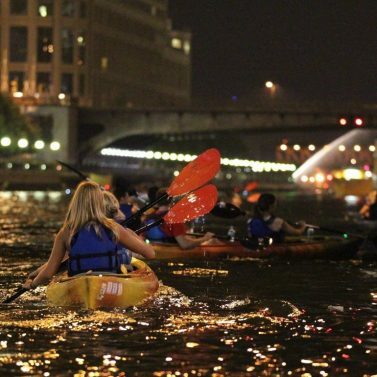 Since 1997, we have hosted over 100,000 urban adventurers through this wonderful waterway! For over 20 years, we have taken great pride in our tours. Carefully curated scripts are informative and entertaining, while our personable, experienced guides have both the knowledge and dedication to make sure you have a memorable, safe journey with us. Rental hours reopening May 2019. 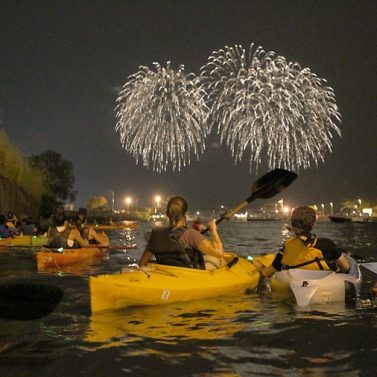 Looking to create your own adventure on the Chicago River? 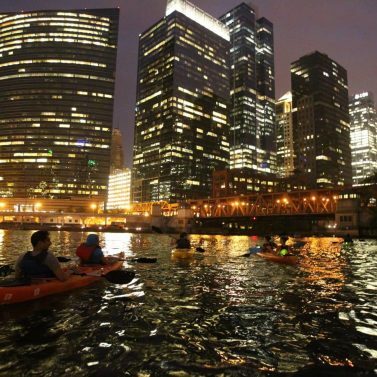 Rent our kayaks by the hour and explore the downtown area! Ahoy! Our kayak tour schedule for the 2019 season is now available. Online booking is simple and quick. Reserve your seats now! We are also taking private tour requests at this time.